Northern-central British Columbia is susceptible to climate change and its impacts. The City of Prince George is preparing for climate change in order to avoid potential disruptions to the systems that residents rely on. Such long range planning requires regional climate information. 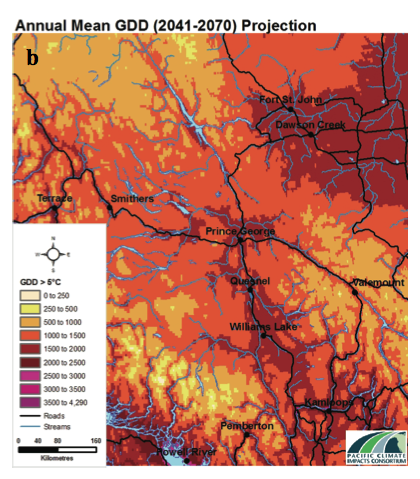 This report summarizes historical trends and projected future changes in the hydro-climatology for Prince George and surrounding areas. Much of the analysis has been presented at workshops in Prince George. This report provides a summary of potential implications, vulnerabilities, and opportunities based on input gathered at these events as well as additional research. Prince George is located in an area of strong climate variability and trends. The effects of climate variability, such as the El Niño / Southern Oscillation (ENSO) and the Pacific Decadal Oscillation (PDO), on climate and hydrology are presented. During the ENSO warm phase (El Niño) winters are 1.5°C to 2.0°C warmer on average with 5% to 15% less precipitation than usual; during its cool phase (La Niña) winters tend to be cooler and wetter than average. The warm (cool) phase of PDO adds an additional influence of approximately 1.0°C over decadal time scales. This climate variability is associated with reduced (enhanced) streamflow at several nearby locations during warm (cool) ENSO and PDO phases. Prince George has experienced an average warming trend of 1.3°C over the last century. Night-time low temperatures increased more rapidly than day-time highs. In recent decades, Prince George has become ‘less cold’ and a greater percentage of precipitation has fallen as rain rather than snow. These climate trends are consistent with streamflow trends at several locations where flow increased (decreased) in winter (summer). Annual temperatures in the region are projected to increase an average of 1.6°C to 2.5°C by the middle of the 21st century. Precipitation is projected to increase by 3% to 10% primarily in winter with possible decreases in summer. The magnitude of projected temperature change is likely to result in serious impacts as they are above the historical range in variability for this region, and will create conditions that have not occurred historically. Changes to streamflow timing and amount will depend on watershed location and type. The City of Prince George is using this report in its flood risk assessment and in preparing the Adapting to Climate Change in Prince George report. Recommendations for further use of climate information to incorporate adaptation into the City’s land use and maintenance plans include seven actions that can be taken based on existing information, three that require information not included in this report, and nine that require additional analysis to thoroughly assess the vulnerability of infrastructure, improve emergency planning and maximize any positive benefits.